With the UK’s plans for a new fleet of nuclear power stations looking to have decisively stalled, can renewables bridge the looming power generation gap? Britain currently has eight operational nuclear power stations with a combined capacity of 9GW. Together, they produced 70TWh of power in 2017 – more than a fifth of the total 336TWh of power generated in the UK during the year. They also provided around two-fifths of the country’s low-­carbon generation. With the exception of Sizewell B, they are all currently scheduled to close by the end of the next decade. Along with the phase-out of the last remaining coal plants by 2025, their loss will leave a large gap in Britain’s generation capacity. For a long time the government intended to replace this lost capacity with a fleet of new nuclear power stations. Plans have been developed for a total of six: Bradwell B, Hinkley Point C, Moorside, Oldbury, Sizewell C and Wylfa Newydd. But we are still yet to see the nuclear renaissance that was promised. More than two years after the contracts were signed, Hinkley Point C remains the only one of the six actually being built. EDF originally expected the power station to be up and running by 2017 but is now aiming for 2025 at the earliest. Following a long and fruitless search for a buyer, Toshiba finally decided to pull the plug on its Moorside project in November. Just a few months later, in January, Hitachi shelved Wylfa Newydd and Oldbury after failing to negotiate a satisfactory deal with the government. These last three alone were to have provided 9.2GW of capacity and could have been expected to produce 70-80TWh of electricity a year – around the same amount as the whole of the existing nuclear fleet. In its 2018 progress report, the Committee on Climate Change (CCC) forecast that 120TWh-worth of low-carbon generation would be up and running by 2020 and remain online until the end of the following decade. By 2030, the climate watchdog said, the UK would need at least another 130-145TWh to meet the fifth carbon budget covering 2028 to 2032. Of this, the committee expected current policies to deliver 70TWh, leaving a gap of 60-70TWh. Yet none of the committee’s six possible scenarios for meeting the budget are especially reliant on Moorside, Wylfa Newydd or Oldbury. Given the repeated setbacks to the nuclear programme, most feature only Hinkley Point C and Sizewell B, with the remaining scenarios also assuming the presence of one further new-build project. The shortfall left by their absence only fully materialises in the 2030s. Nevertheless, this gap will still need to be filled in the meantime. According to analysis by the Energy and Climate Intelligence Unit (ECIU), replacing a shortfall of 73TWh would require an additional 14GW of onshore wind, 28GW of offshore wind, or 104GW of solar. For comparison, current capacity stands at 7.9GW, 12.9GW and 13GW respectively. In practice, the gap would probably be filled by a mix of all three. ECIU says this could be done, for example, with 11.3GW of offshore wind, 5.7GW of offshore wind and 20.8GW of solar. This would cost on average between £50-£65 per megawatt-hour (2012 prices), including £5-£20/MWh for system integration costs. With the government offering Hitachi a strike price of up to £75/MWh for Wylfa Newydd, ECIU concludes that renewables have now become the cheaper option. Increasingly, it is a view that appears to be shared by ministers. In a statement to parliament explaining the failure to reach an agreement with Hitachi, business and energy secretary Greg Clark said a higher strike price could not be justified “given the declining costs of alternative technologies”. 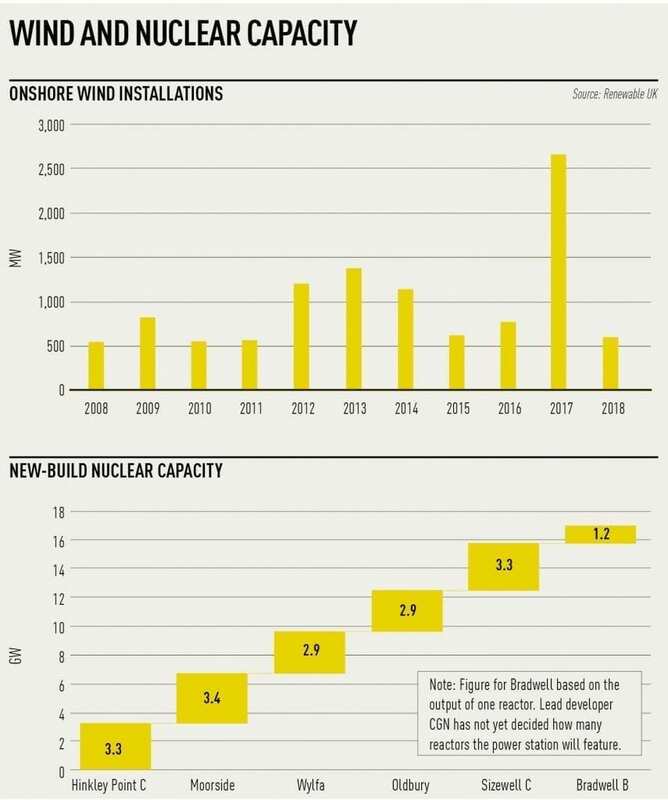 ECIU head of analysis Jonathan Marshall says: “In recent years government has quietly cut back its expectations for nuclear new build, and that’s looking more and more realistic as the price of renewable generation falls and the benefits of the flexible smart grid become more apparent. However, Thomas Edwards, senior consultant at Cornwall Insight, believes that this kind of expansion could not be achieved under current policies. In particular, onshore wind and solar lack a proper route to market due to their ongoing exclusion from auctions of contracts for difference (CfD). Edwards says the problem of price cannibalisation – whereby wholesale power prices are depressed by existing renewables with low marginal costs and access to subsidies – means few developers will be able to deliver projects without access to some form of revenue stabilisation. Gareth Miller, chief executive of Cornwall Insights, recently wrote to energy and clean growth minister Claire Perry to suggest onshore wind and solar developers be allowed to bid for “floor price” contracts guaranteeing a minimum price for the electricity they produce but allowing them to keep any excess once previous subsidies have been repaid. He said this would minimise costs for consumers while protecting investors against price cannibalisation. The closure of the Renewables Obligation scheme (a support mechanism for large-scale renewables projects) to new applicants has already led to a collapse in onshore wind installations. Last year, they plunged 80 per cent to the lowest level since 2011 following a rush to secure subsidies the year before. In response to Clark’s statement, Emma Pinchbeck, deputy chief executive of Renewable UK, said there is now a large backlog of “shovel-ready” onshore wind projects able to “provide cheap power to consumers and help close the gap on our carbon targets”. Edwards says ministers could also accelerate progress by convincing local authorities to relax informal planning restrictions on turbine size on the basis that it is better to have fewer, larger turbines. This would increase load factors and lower costs. To close some of the gap by using offshore wind, Marshall says the government would need to raise capacity caps in CfD auctions and, depending on the extent of price cannibalisation, hike budgets as well. The cancellation of Moorside, Wylfa Newydd and Oldbury creates more room for spending under the Control for Low Carbon Levies (formerly the Levy Control Framework) that could be diverted elsewhere. But Weijie Mak, GB power market lead at Aurora Energy Research, argues this is about more than just replacing “terawatt hours for terawatt hours”. Wind and solar provide significantly less firm capacity per gigawatt of nameplate capacity, so it would need to come from somewhere else. Although flexibility from batteries and demand-side response could do a lot of the work, Mak says that unless a source of inexpensive, large-scale power storage emerges, Britain may have to “rely on more gas generation for backup”. Mike Hemsley, CCC senior power analyst, agrees. He says the absence of all but a few nuclear plants from the CCC’s scenarios is not a reflection of nuclear’s value (or lack of it) to the UK energy system. Some baseload generation, he says, will probably be needed in the 2030s and beyond, especially if heating is electrified at scale. The CCC has already urged the government on several occasions to formulate a backup plan in case the nuclear programme falters. Given the need for some baseload generation, Hemsley says this plan B should probably include the development of CCS infrastructure. By the time the generation gap arises in the 2030s, the UK may already have reached this point. Maintaining the stability of the power grid would, for example, require greater volumes of frequency response. Britain would therefore need to build more batteries or develop the capability to provide frequency response from wind. While the Moorside, Wylfa Newydd and Oldbury projects could certainly still be revived, to assume that will happen would be foolish. If the UK is to adhere to its long-term climate change commitments, then the government needs to start developing an alternative route to decarbonisation. Not without reason, ministers appear to have developed an fixation with pushing mature renewables to fend for themselves. But as wholesale prices are depressed by existing subsidised renewables, it will become increasingly questionable to consider them a reflection of the “subsidy-free” rate and rely on them to drive investment. Far more important is the overall cost to consumers. And on this front, renewables are gradually becoming the new yardstick against which others are measured. The recent announcements from Toshiba and Hitachi should provide even more reason to resume support for onshore wind and solar, as many have been demanding for several years. Although accelerating the move to a system dominated by renewables will no doubt be challenging, it also presents a huge opportunity for the UK to become a global leader and export its successes to the rest of the world. One door may have closed, but another is still wide open.